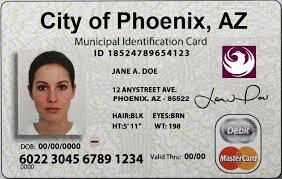 On Wednesday August 31, 2016, the Phoenix City Council voted to approve a municipal ID card program by a narrow 5-4 vote. This is a program that would give quasi-official City of Phoenix ID cards to illegal immigrants. PLEA sees this program as being problematic on several levels. We already have a state entity known as the Department of Motor Vehicles (DMV) which is in charge of issuing driver’s licenses and official state ID cards. Why do Arizona cities now need to get into the ID card business? The list below outlines some of the potential problems with a program of this type. Identity Theft – use of valid but stolen documents to obtain a city ID. The process, as currently laid out, involves the use of civilians and pro-immigration groups. No government employees are involved in the process; however, the city’s name and logo will be on the ID. A city ID could be used as a “breeder document.” These are valid documents obtained through fraudulent means later used to obtain additional valid documents. Legal issues in court. If a person is arrested with only a city ID as a means of identification there could be issues obtaining certified documents and custodian information for court purposes. The possibility of a large influx from areas outside of Phoenix by persons seeking to obtain an ID card. PLEA has partnered with several companies who specialize in law enforcement related training. Additional information as well as locations and dates are regularly updated. PLEA offers its members discounts on tickets and services that can be used in the Valley and abroad. Offers and events are subject to change, visit the Members Only section of the website for more information. Contact the PLEA office staff at 602.246.7869, email us at office@azplea.com or just send us your updates here on our website. Public Safety Financial/Galloway specializes in serving the financial needs of Police Officers and Firefighters. They can assist with Deferred Compensation Management, DROP Counseling / Rollovers, Pension Maximization Strategies and Asset Allocation.